Kids love playing pretend with play kitchens and play food, and this organic fruit and vegetable cart adds even more layers of fun to food role play. This toy looks like a cute little Farmer’s Market cart and comes with a variety of produce, storage bins, and blackboards. There’s a lower shelf offering extra storage space for even more fun cargo. Sized right for young children, the cart is easy for kids to push from place to place and is a perfect play date or sibling toy that will help promote cooperation and teamwork. The cart is part of the EverEarth collection, in which all products are eco-friendly and manufactured with materials that are FSC certified along with safe, water based paints, and recycled packaging. Plus, for every toy bought, EverEarth will plant one tree. The cart comes with lots of accessories, including the cart itself, a billboard, four stands, four chalkboards and four each of the following: bananas, pears, oranges, and tomatoes. Due to some small parts, this toy is suitable for tots ages 36 months or older. Kids love playing pretend with play kitchens and play food, and this organic fruit and vegetable cart adds even more layers of fun to food�role play. 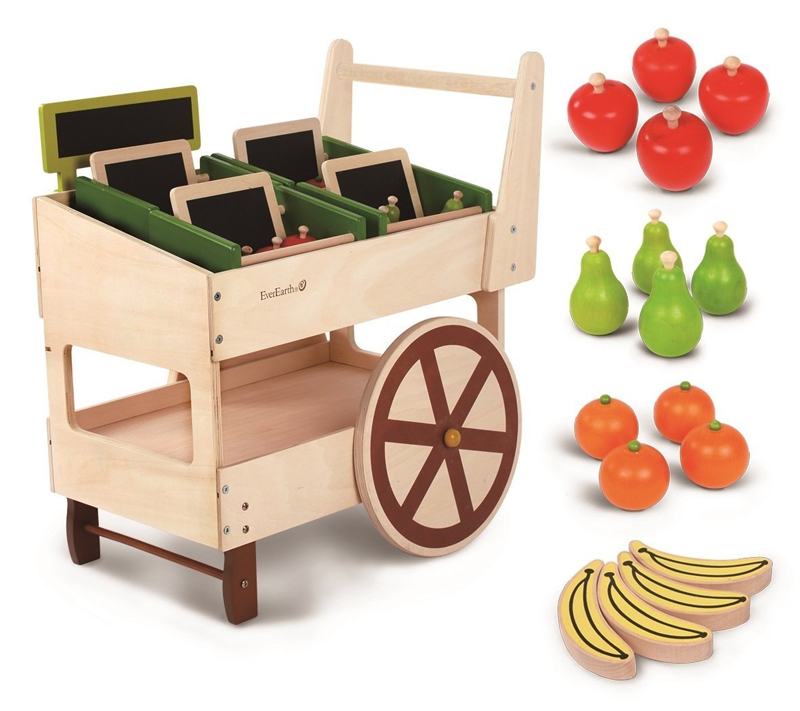 This toy looks like a cute little Farmer's Market cart and comes with a�variety of produce, storage bins, and blackboards. There's a lower shelf offering�extra storage space for even more fun cargo. Sized right for young children, the cart�is easy for kids to push from place to place�and is a perfect play date or sibling toy that will help promote cooperation and teamwork.�The cart is part of the EverEarth�collection, in which all products are�eco-friendly and manufactured with materials that are FSC certified along with safe,�water based paints, and recycled packaging. Plus, for every toy bought, EverEarth will plant one tree. The cart comes with lots of accessories, including the cart itself,�a billboard, four stands, four chalkboards and four each of the following: bananas, pears, oranges, and tomatoes. Due to some small parts, this toy is suitable for tots ages�36 months or older.